A new Pew poll has majority support for marijuana legalization, treatment instead of jail for hard drug users, and getting rid of mandatory minimums. Now, how do we translate that into policy? Washington, DC, Mayor Vincent Gray has signed a decriminalization bill. Now, Congress must act to stop it within 60 working days or it becomes law. 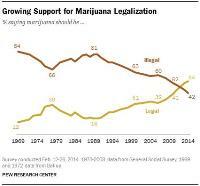 But this is by no means the end of pot politics in the nation's capital. A national clinical cannabis conference is coming to Portland next month, state legislatures continue to deal with medical marijuana and CBD bills, Colorado wants to crack down on high plant-count patients, and more. More jail guards gone bad, evidence has gone missing in Alaska, a Georgia cop sells pot from his patrol car, a North Carolina detective working prescription pill diversion diverts some his way, and more. No marijuana legalization in New Hampshire this year, neurologists recommend cannabis oil for MS, New Mexico pharmacists will start prescribing naloxone, Russian-US drug cooperation is at risk over the Crimea crisis, and more. Medical marijuana and CBD bills continue moving in state legislatures, Northeastern governors respond to opiates, the Department of Agriculture wants to buy Ukrainian hemp seed, and more. Garden State municipal prosecutors say legalize it, an Arizona sheriff has to give back medical marijuana seized rom a patient, Colorado wants to crack down on high plant-count patients, Louisiana takes a resolutely last century approach to heroin, Uruguay is going to seriously track its legal weed, and more. No April Fools' stories here -- the mayor of Washington really did sign a decriminalization bill, the Kentucky legislature really did pass a CBD medical marijuana bill, the US government won't help Honduras shoot down drug planes, and more. A new Pew Research poll has some surprising and heartening results, Madison (WI) says legalize it, Wisconsin passes a CBD medical marijuana bill, misbehaving cops get noticed, the Russians are griping about the Aghan poppy crop again, and more.